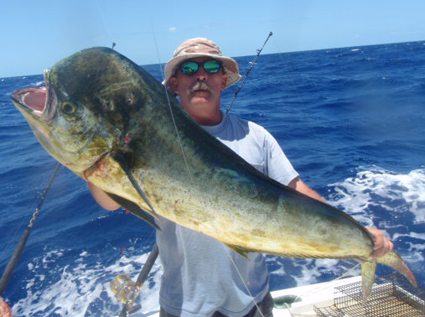 For the dedicated Keys offshore angler June is the month to look forward to. It is the month that more large dolphin are taken than any other. There are more opportunities to get that 50 pound plus fish now than any other month of the year. When we are targeting the big ones on the FUNYET we have a few techniques that run slightly counter to traditional thinking. 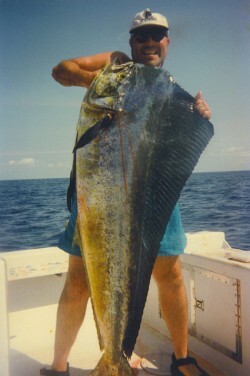 These techniques have rewarded us with five fish in the mid fifty pound range and one to almost seventy – all taken in June. The first thing that you need to do is think of the big boys, those in the forty pound plus range, not so much as big dolphin but more as a pack of wolves. These guys are feeding mainly on schoolie dolphin. If you picture in your mind the National Geographic type documentary on wolves as they are stalking a herd of caribou you will notice several things about their behavior that can be equated to the big dolphin stalking schoolie sized fish. The first thing is that the wolves are not found in and amongst the herd of prey. They tend to parallel the herd from just outside the prey’s comfort zone. In water of course you have the added dimension of depth. The big boys will often track the prey sized guys from deep in the water column. The wolves watch and wait for one of the herd to make a mistake or go lame. Only then do they move in for the kill. The same thing is happening with the large dolphin while they stalk the small fish. When you find schoolies you have a good chance of finding their tormenters within a hundred yards to the side or even a hundred feet below. We all know to look for dolphin along the weed lines, along current breaks and color changes. And it does pay to work those areas to insure that dinner is going home in the box, however, when you have your fill it is time to change strategies and start to target the big boys. The first thing to do is move off of the weed line by at least a hundred yards. I tend to favor the outside of the line away from shore. I parallel the line and zigzag in and out by about fifty yards. I also drop a bait back behind the spread by an extra couple of hundred feet depending on how weedy and rough the water is. Tough conditions will dictate the baits be kept within eyesight to insure they are being fished clean of fouling weeds. The next step is to drop your downrigger bait even deeper than normal. Remember that there is a diminishing return on how deep you fish your down rigger. The resistance of the water on the weight, bait and lines will dictate that you will need to put out more line than the corresponding depth you seek. Getting your bait to between fifty and one hundred feet down will get you in the strike zone for the big boys. If you don’t have a down rigger, go get one. With what you have invested in your boat, tackle and fuel, it pays to add such a valuable asset. You can acquire a quality downrigger for the price of a few days fuel so there is not a real excuse for not having this important piece of gear. The down rigger accounts for a least twice what my surface rods produce. When available fish bait that will get their attention. Medium to large ballyhoo make great bait. I always put a skirt or artificial in front of my natural bait. The artificial will help to hide your rigging effort, help prevent premature bait wash out and finally add needed color to help attract fish from farther away. Skirt color is a hotly debated topic, however, I tend to mix my colors between the natural bait colors of blue and white to mimic flying fish and green and yellow, green and blue or blue and yellow to mimic the color of dolphin. When you get a strike you should do everything to keep your other baits fishing as long as possible to help insure that if there is a really big boy out there you will have every opportunity for him to eat. During the first minute of a fight keep your boat speed constant. Then, if you are going up sea, start a wide turn to the offshore side while you start to slow down. This gives you even more time for that big boy back there to find and eat a bait. I have even had the big ones eat multiple baits while maneuvering to fight the first fish on the line. It is now that it becomes so important to have natural bait as opposed to strictly fishing artificial baits. When you slow down to fight a fish your artificial baits become pieces of plastic slowly sinking in the water column. On the other hand your rigged natural baits simply become dead bait. Dead bait is vastly preferred by dolphin everywhere to plastic. At this point when you are going slowly, your down rigger will fall even deeper than it was while you were trolling. Keep an eye on your down rod and your far line for signs of a fish while you are fighting your first fish. When you start to get your fish near the boat take a close look all around your boat to make sure that there is not a big one scouting the action. Always have a pitch rod available with a big pinfish or other live bait ready to throw if you do see one. Only when the first fish is nearing the boat should you consider whether or not to clear the other lines to avoid loss of your first fish. Another condition to look for when targeting big fish is a pod of spotted dolphin (the mammal). There have been many occasions that I have been trolling when we were joined by large pods of these playful creatures only to have a really big dolphin (the fish) take a bait while we were not paying attention. Take advantage of the time of year and the conditions to get out and bag a brag worthy fish.